Well, Friday night just happened to be the perfect time for me to upgrade our seats at work to SolidWorks 2009 SP2. Overall things went smoothly and I was on my way home in time for some awesome pot roast served up by my multi-talented wife. So what’s new in SolidWorks 2009 SP2? Well, thanks to a head’s up from Lou Gallo and the guys at DDi, I heard about a new selection option that makes its debut in SolidWorks. You now have the ability to select “Connected Faces”. The option is available in the Right Mouse Button menu and presents the user with a flyout toolbar that offers multiple selection options for the surrounding faces of the selected face. Also new is the ability to publish models directly to 3Dvia.com. The option is available in the pull down menu under File. Here’s a quick video showing off the new features! 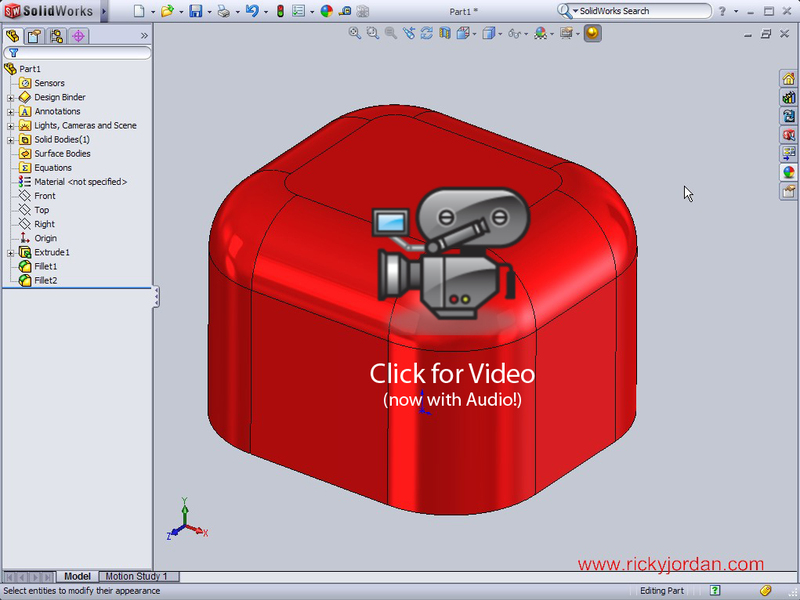 UPDATE – 2-28-09: It looks like there is EVEN BIGGER NEWS when it comes to SolidWorks 2009 SP2.0. Click HERE to see some new options in Renaming Configurations!! Well Done Ricky. Good information and right to the point. Thanks. Great job Ricky.. This will be very useful.. This is cool, thanks for the share, I appreciate it big time, thanks once again. Thanks a lot! Amazing Post! The ability to rename part configurations while they're being referenced by an open assembly or drawing is indeed especially handy for the default configuration, which many of us forget to give a meaningful name until we come to create alternative configs, which is typically after we've created an assembly.